During the Six-Day War of 1967, Israel captured the Golan Heights from Syria. In 1981, Israel officially annexed the territory. 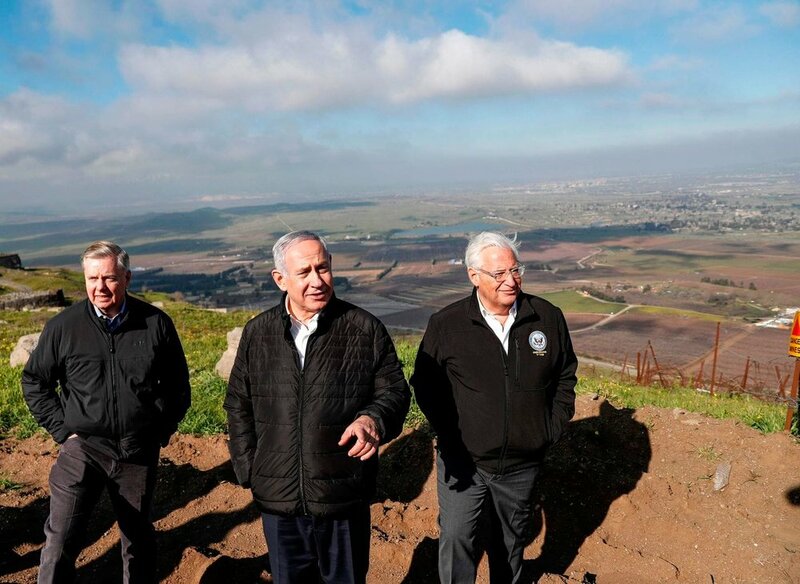 The entire international community–including the US until yesterday–has refused to recognize the annexation, but instead considers the Golan Heights as occupied, and the Israeli settlements there (as well as in the West Bank) as illegal. Is it anti-Semitic to refuse to recognize Israel’s spoils of war? And what is the significance of the US’s reversal of this half-century policy? Conventional wisdom says, there’s a war. Your country wins the war. Your country gets to keep the goodies, right? It’s called “to the victor go the spoils.” We think that’s how it goes because we are not familiar with international law. It’s time to get familiar. This is not complicated. Boys and girls, “spoils of war” is an outdated, outlawed method of acquiring territory. Customary international law and treaty law dictate the unacceptability of use of force and its partner, spoils of war. The UN Security Council has taken a consistent stand against annexation. One memorable example: when Iraq invaded Kuwait in 1990 and attempted to annex it. The UN Security Council produced resolutions, and subsequently took military action against Iraq in order to liberate Kuwait. This is a significant development of modernity: it brings to an end (in theory at least) the constant warring for expansion of territory that was a feature of the Middle Ages. War is always destructive, and always leads to more war, as subjugated people refuse to be subjugated and the powerful refuse to relinquish power. International law, bottom line, forbids the annexation of land, as well as the recognition of annexed land. That’s why the world has refused to recognize Israel’s takeover of the Golan Heights–until now. Security Council Resolution 298 (1971) applied the same principle of inadmissibility of acquisition to East Jerusalem. Donald Trump’s decision to recognize Israel’s annexation of the Golan Heights–an apparent personal favor to Israeli PM Netanyahu–is a breach of the territorial integrity principles of international law that may reverberate far into the future, to the detriment of oppressed peoples and the benefit of the powerful. When the world’s only superpower snubs international law, it is more than a single act. It is a precedent. As the New York Times points out, the Israeli right sees Trump’s move as an “encouragement to pursue annexation of territory in the West Bank.” While the situation in the West Bank is already dire (though arguably not as dire as Gaza), annexation would take the region to a whole new realm of trouble, beyond the scope of this little lesson. For now, suffice it to say that as Donald Trump glibly hands over a part of one sovereign country to another (as though it were his to give–not unlike his 2017 Hanukkah gift of Jerusalem to Israel), he is giving the green light for a new era of the powerful denying self-determination to the powerless. By the way, both houses of Congress are in the process of crafting legislation that would give official US recognition to Israel’s illegal annexation. Our legislators must be pressured to oppose these bills. • The House of Representatives' bill is "H.R.1372 - To clarify that it is United States policy to recognize Israel's sovereignty over the Golan Heights." Class dismissed. Homework assignment: contact your legislators (reach your Rep here and your Senators here).